I'm not going to lie, as much as I was looking forward to this release, some of the buzz leading up to it had me, well, more concerned than I wanted to be. Because look, I like Ought for their smart, amazingly well-textured and nervy post-punk that especially with their record Sun Coming Down in 2015 saw greater refinement in its melodic grooves and complex transitions. And for as much as Tim Darcy could sound like he was splitting his David Byrne impression with that of Elias Bender Ronnenfelt of Iceage, this sort of artistic but deeply felt indie rock is an easy sell for me. And that's before you consider how well they can translate the anxious tension at their core into the sort of unstable core where you literally cannot predict its shifts. But in the rollout for Room Inside The World, I starting hearing buzz that the band had changed labels and this record was embracing more new wave and synths and streamlining things even further - and I was really conflicted on this, mostly as the critical reception seem a little more reticent. Don't get me wrong, I appreciate Ought looking to intensify their internal sense of logic and composition within the songs - the improvisation is a nice touch but it can lead to mixed rewards - but there is such a thing as over-polish when you look at a band like Ought where you can lose some of the wild spirit that makes them distinct. And considering the mixed reception to Tim Darcy's solo project a year or so back, I wasn't sure how that would translate onto this project, but what the hell: what did we get on Room Inside The World? Man alive, I really wish I liked this project a lot more than I do - because on some level, I get it. Ought choosing to embrace more polish and restrained composition could have created potent results if they had tilted into the unstable bombast that made their first two records so starkly memorable. 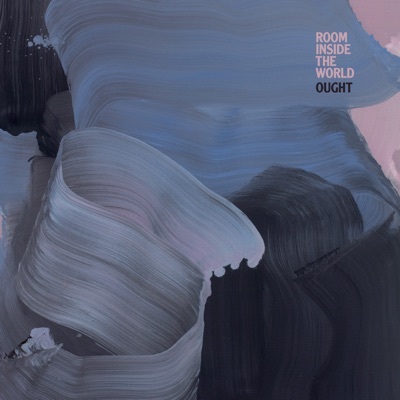 Unfortunately, Room Inside The World is the sort of record where I can hear the rationale for every artistic choice, but it seems like the majority of them were a perfect storm of misfires - and what's alarming is that it's less interesting than that actually implies, reminiscent of the early-to-mid 80s post-punk records that lost their ragged edges and punch but weren't slick or colourful enough to gain mainstream traction. Not precisely a bad project - the fundamental core of Ought's musicianship is strong enough to keep me listening - but the spark feels snuffed out, and it winds up far less interesting or compelling. And the place we have to start with is frontman Tim Darcy - and remember how I made comparisons to David Byrne and a certain nervy, nasal presence? For some reason, Darcy decided to embrace a more broadly theatrical mode of delivery, dipping into a wonky baritone that had some drawing comparisons to early Nick Cave but reminded me more of the yodeling tones of Kevin Rowland of Dexy's Midnight Runners, except minus the intensity that made those vocals tolerable! That's what's genuinely alarming about Darcy's delivery here, you can tell he's trying to modulate for some brand of romantic crooning to match with the slicker grooves and while there are songs like 'Desire' and 'Brief Shield' where he gets close - mostly courtesy of production that gives him a bit more space or in the case of 'Desire' a seventy person backing choir - he's not convincing in this mold at all! What's worse is that there are snippets on 'Disgraced In America' and 'Take Everything' where hints of that more clipped, Byrne-esque delivery comes back and it's such a better fit for these grooves and style of writing. And about that writing: one of the anchor points behind what made Ought so compelling was how when confronted with soulless social constructs, our protagonist bucked against them in a rather ingenious way: embracing just enough of the language to fit the conforming archetype, but twisting it slightly to rip the blinders away from everyone watching just like what happened to him - a disruption of the system on a song like 'Beautiful Blue Sky' that wasn't just exultant, but revelatory. So why Ought thought tilting into disaffected distance on this record would have anywhere close to the same impact is mystifying - again, I get it, songs like 'Into The Sea' shows the emotional weight pressing them down further, and 'Disgraced In America' highlights not just the walls of ideology he's built, but how the musical act of performing those protest songs are just as systemic, so why not embrace detachment on songs like 'Disaffectation' and 'Take Everything' like fellow Canadian indie darlings The New Pornographers did on Whiteout Conditions? Well, for one, the entire arc of that record was realizing the tremendous danger of that choice, and for another, it doesn't exactly help us get invested in the romantic sentiments that fill up most of the rest of Room Inside The World, which also aren't helped by Ought's jagged, scattershot writing style that's less impressionistic and more just obtuse for its own sake. Yes, in capturing the reality of fading affection on 'Desire' that distance works to emphasize the tragedy, but more straightforward moments of love like 'These 3 Things' and 'Brief Shield' fall flat, and the lingering melancholy of 'Alice' - intended as a tribute to the late great jazz pianist Alice Coltrane - fades into a droning outro that feels like a dark counterpart to how Sun Coming Down ended showing instead the discomfort of not knowing that direction, but to then imply it's because of his openness to experiences flies in the face of the existing themes and a really damp, sour note on which to end the album. Of course, this could have all been forgivable if the record hit with any sort of consistent dramatic swell or momentum, or took any of the wild melodic shifts that made Sun Coming Down so compelling... and yet that doesn't happen. I'll give the rhythm section all the credit in the world for trying to add some momentum or spark to this record - 'Take Everything' has some of that jittery momentum in the snare line and 'Disaffectation' nearly gets there as a pastiche of The Cure if it wasn't for that wonky slowdown with really ugly synth choices. Hell, between those glassy synth gurgles pushed into 'These 3 Things' and the atonal drones over 'Pieces Wasted', I'd say the synth choices are by far the most incongruous parts of this record - but even when you get promising lead guitar lines there's none of the edge or momentum to really add character to these tunes. Fine enough foundational melodies, sure, but it's not like Ought really cares about nailing a hook, and even if they do the tempos are all too languid and measured to really make them pop, and even on a song like 'Take Anything' that actually does open up for a solo, its tempo and melodic throughline doesn't match with the hook at all! But even then I wouldn't say the guitar melodies are nearly as developed or interesting as what characterized their last record - even with songs like 'Desire' trying to evoke more ornate bombast, you're not getting a song with a melody as potent as 'Passionate Turn', and certainly not with the same edge. So look, I get that this album was trying to be more classy and languid and measured, but in making that artistic pivot it renders so much of what made Ought interesting a lot weaker, even if internally there is some consistency. But the melodies are not as catchy or interesting, the content doesn't pack nearly the same punch romantically or otherwise, the vocal delivery gets grating really fast and not the way the band has intended in the past, and any snippet of groove or wildness just reminds you of a band that used to be a lot more compelling. For me, this is a light 6/10 and kind of hard to recommend - there's better post-punk that not only doesn't feel so indebted to its influences, but also can get abstract with its narrative and stick the landing. Unfortunately, while it's passable, Room Inside The World didn't get there.